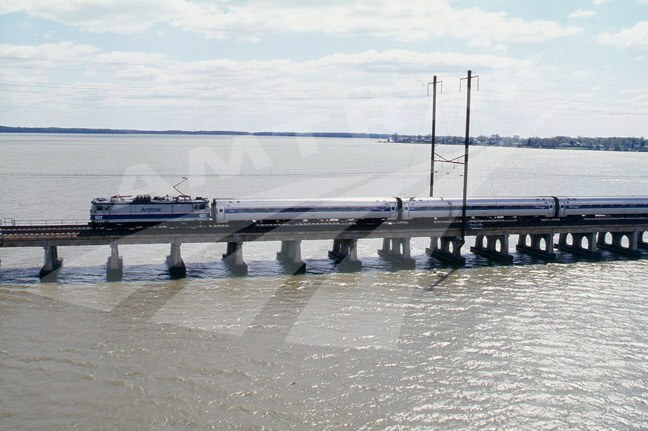 Home > Archives > NortheastDirect train crossing the Gunpowder River, 1997. When Amtrak began operations in 1971, many of the trains in the Northeast bore individual names carried over from the predecessor railroads. Amtrak retained the colorful names until fall 1995, when all the Northeast Corridor trains were rebranded under the NortheastDirect umbrella and simply known by their numbers. According to a November, 1995, article in the Philadelphia Inquirer, the NortheastDirect rebranding campaign included interior refurbishment of approximately 150 cars that received new seats, upholstery and carpeting. In 2008, Amtrak introduced the current Northeast Regional brand. Amtrak contracted with the General Motors Corporation's Electro-Motive Division (EMD) to design and manufacture the AEM-7 electric locomotive, a high-speed, lightweight model based on Swedish designs. The AEM-7 was produced from 1978 to 1988, and could reach speeds up to 125 mph. They were ordered to supplement the E-60 locomotives and replace the GG-1s inherited from the Pennsylvania Railroad. Photographer: Peter Garfield for Amtrak.